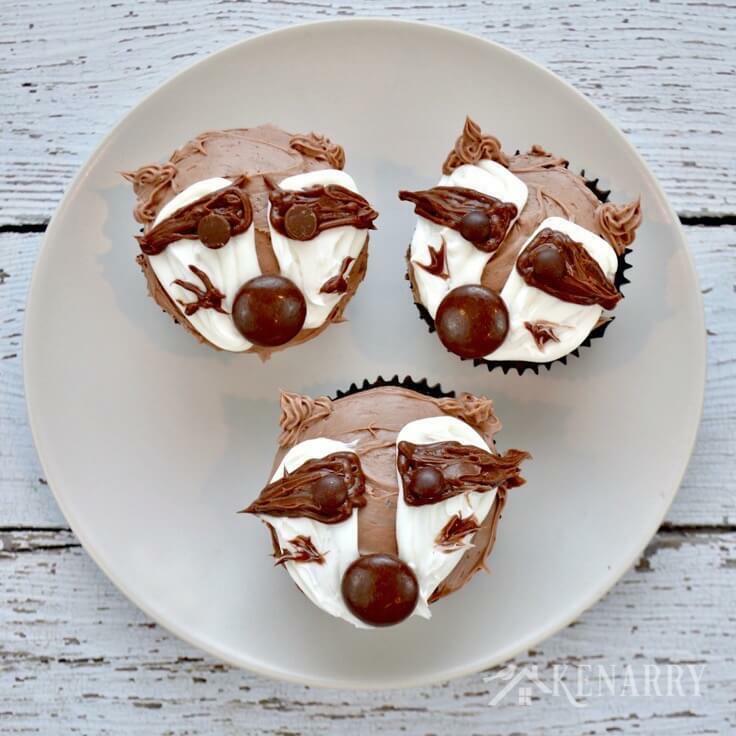 Kids will love these adorable raccoon cupcakes. This easy decorating tutorial with a video shows step-by-step how to use frosting to create a fun dessert. Looking for a cute dessert idea that your kids will love? 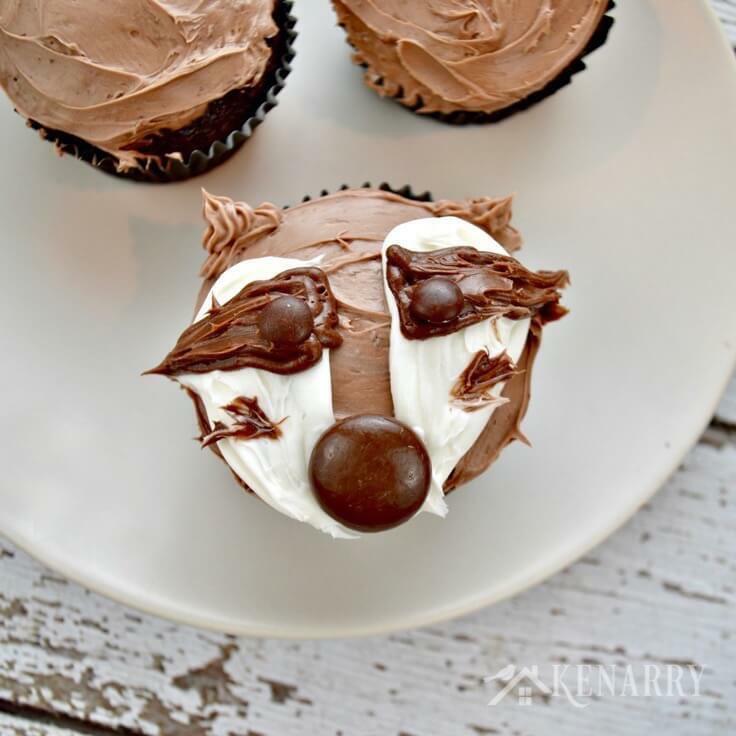 Try making these adorable Raccoon Cupcakes. Today we’re sharing an easy step-by-step tutorial showing how to use frosting to create this fun treat – we even included a video! Every year in the fall our school hosts a family fun festival. Each grade level has to bring something to support and help the festival. Our first year it was super easy. We just had to bring a 12-pack of pop. This year though we had to bring a dozen cupcakes that would be used as prizes for a “cupcake walk”. A cupcake walk is just like a cake walk, if you’re familiar with how those work. Basically kids walk around in a large circle stepping on squares of paper or something on the floor while music plays. Each paper has a number on it. When the music stops, every kid scurries to quickly get on one of the numbered squares. Then an adult reaches into a hat or spins a wheel to pick a number. Whatever kid is standing on that number wins a half dozen cupcakes. The instructions from school said we could either buy cupcakes or they would provide plastic containers to hold cupcakes if we wanted to make them ourselves. I’m always up for a challenge and love making fun food for kids like the birthday cakes I’ve made for my boys, crazy face tacos, stuff like that. The only question was what kind of cupcakes would make a great prize that a kid would actually WANT to win? I thought about simple ones with a thick layer of frosting and colorful sprinkles. But then I came across a video on Facebook from Simple as That for making the cutest fox cupcakes. They were so cute and looked really easy to make. After watching this video I was totally inspired to come up with a similar animal idea for our cupcake walk prize! I was talking about it with my talented baker friend, Meaghan at Cook. Craft. Love. She suggested I ought to make Raccoon Cupcakes. I thought that was a brilliant idea! The boys and I have always loved The Kissing Hand and A Pocket Full of Kisses by Audrey Penn about a mother raccoon and her sons. Raccoons have a similar shaped face to a fox, so I thought a raccoon face would look just as adorable on a frosted cupcake. 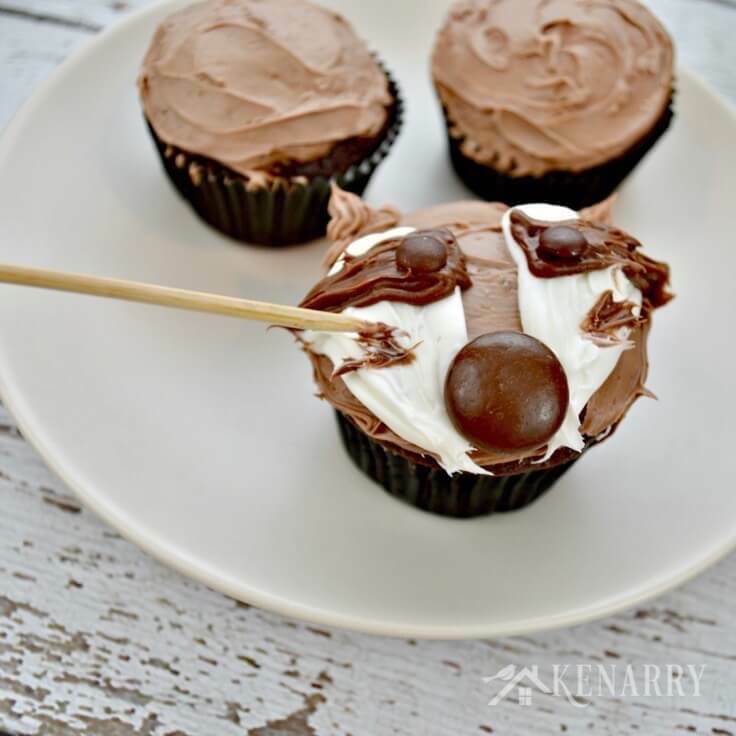 Raccoon Cupcakes are really simple to make especially if you use a boxed cake mix, canned frosting and chocolate coated candy like I did. I even made a little video tutorial so I could show you step-by-step just how easy it is to make your own Raccoon Cupcakes. 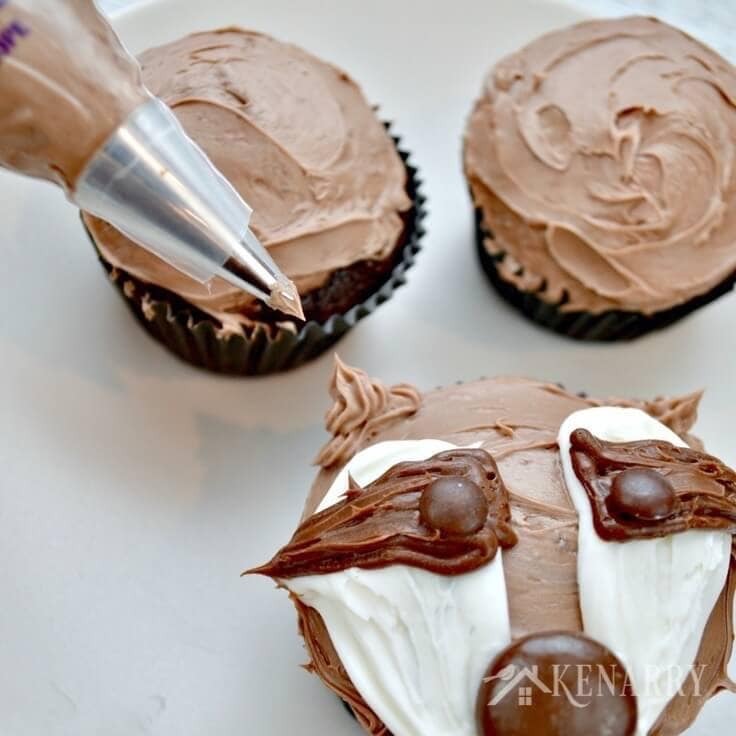 Raccoon cupcakes are really easy to decorate with frosting, chocolate candy and a few simple tools. Mix and bake the cupcakes in the muffin pan according to the directions on the cake mix. I used a chocolate cake mix, because I think “brown” for raccoons. Any flavor cake mix would work for Raccoon Cupcakes though. Allow the cupcakes to cool completely before frosting. In a small mixing bowl, combine a little chocolate frosting and white frosting to create a light brown color. I used about 50/50 of each color, maybe a little more of the chocolate frosting. 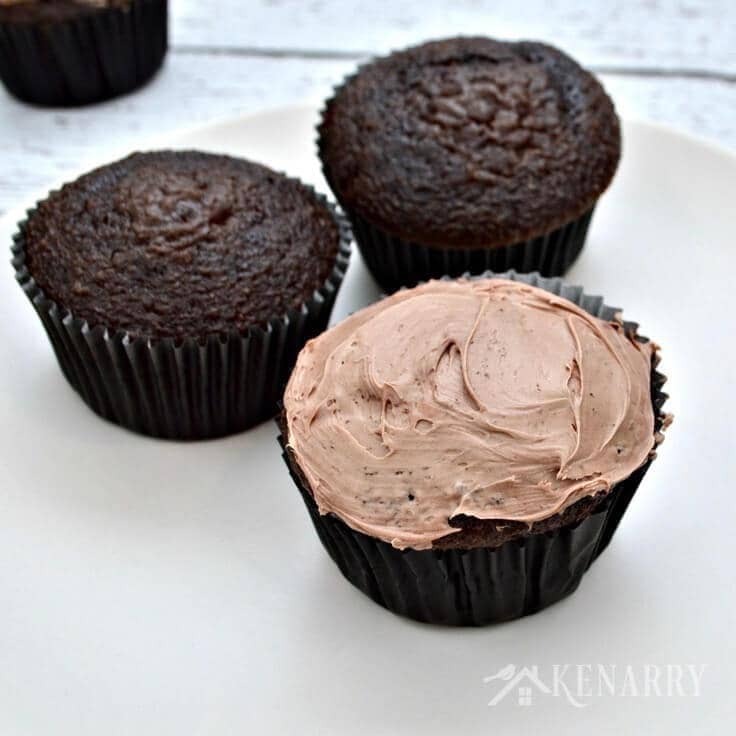 You’ll use this light brown frosting to spread a base layer on each of the chocolate cupcakes. Later you’ll also use it for the ears so I’d suggest using at least half of each container of frosting. When you frost the cupcakes, use a circular motion and always move your knife or metal frosting spatula in the same direction. This helps to minimize the number of crumbs you pick up with your knife. Fill a resealable storage bag or a cake decorating bag with white frosting. Cut the tip off one of the corners on the bottom of the bag with a pair of scissors. Gently squeeze the bag to ice a small face on the Raccoon Cupcakes, like you see in the photo below. The shape of the white part looks like a half heart to me. You may want to smooth the white frosting with a knife. Next put a small tip in the bottom of a cake decorating bag and fill it with chocolate frosting. Use the chocolate frosting you still have in the store container, NOT the light brown you mixed in the first step. Raccoons always look like masked bandits, so you’ll use this chocolate frosting to create a mask. Again, you may want to use a knife to smooth the chocolate frosting after you pipe it on with the cake decorating bag. 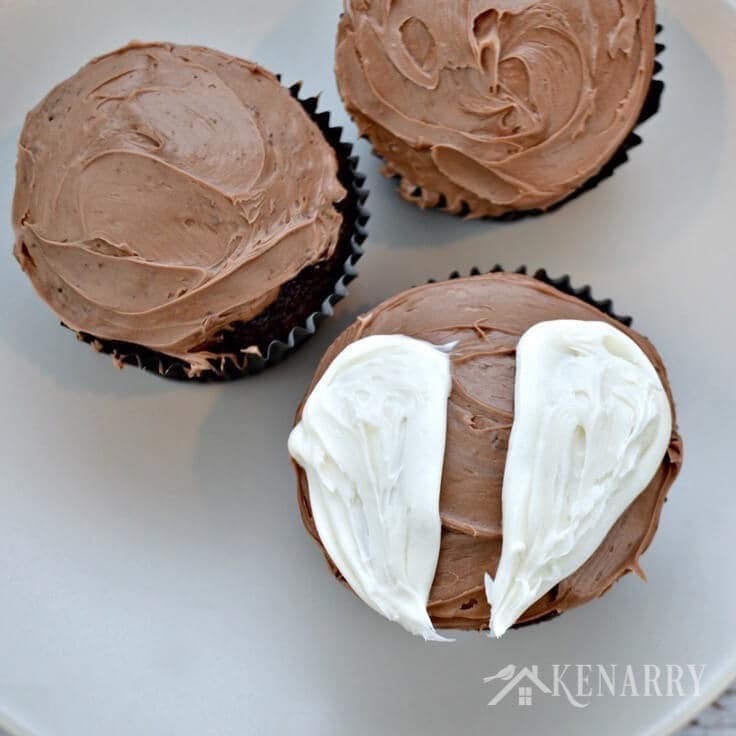 Now put a big round chocolate candy at the base of the two white half heart shapes to create a nose for the Raccoon Cupcakes. Any chocolate coated candy will work, but I used Hershey’s Drops for these. I just made sure the Hershey name/branding was pointed down so it didn’t show on the Raccoon Cupcakes. Likewise I used two chocolate covered Mini M&Ms for the eyes. I tried chocolate chips for the eyes too which you might notice in some of the pictures. They worked just fine, but I liked the Mini M&Ms better. At this point in the process the Raccoon Cupcakes could almost pass as sloths, don’t you think? Sloth Cupcakes would have made a really fun cupcake walk prize too since the movie, Zootopia is such a big hit with kids right now. Put a small star decorating tip in the bottom of a cake decorating bag. 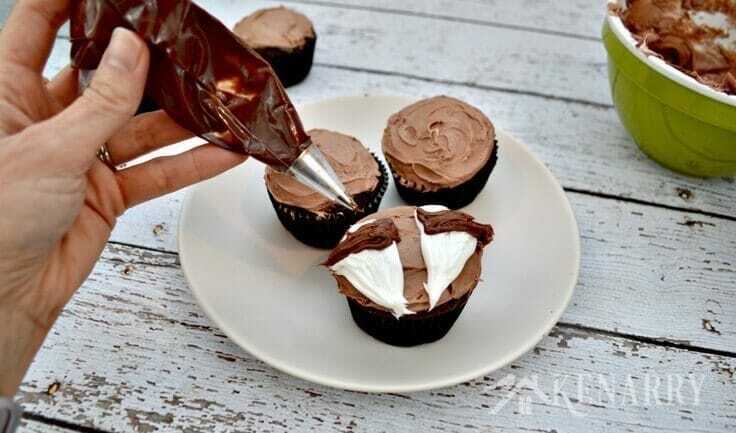 Fill the bag with the leftover light brown frosting you used for the base layer on the Raccoon Cupcakes. Gently squeeze the cake decorating bag to pipe ears onto the top of the raccoon’s head. I tried to make mine triangular and sort of built them up like you would a soft serve ice cream cone. To make whiskers for the Raccoon Cupcakes, take the chocolate frosting you still have in the decorating bag from making the raccoon’s mask. Use it to put a dot of chocolate frosting on each of the raccoon’s cheeks. Then use a wood bamboo skewer to fan out the chocolate frosting like wispy whiskers. 8. Box Up the Cupcakes and Enjoy! Once you’re done frosting the remaining Raccoon Cupcakes, box them up in plastic containers if you’re going to use them for a cupcake walk prize. We were all giddy when we arrived at the family fun festival and saw a little girl proudly walking around with a 6-pack of our Raccoon Cupcakes. She was grinning from ear-to-ear showing her friends the big “prize” she won. 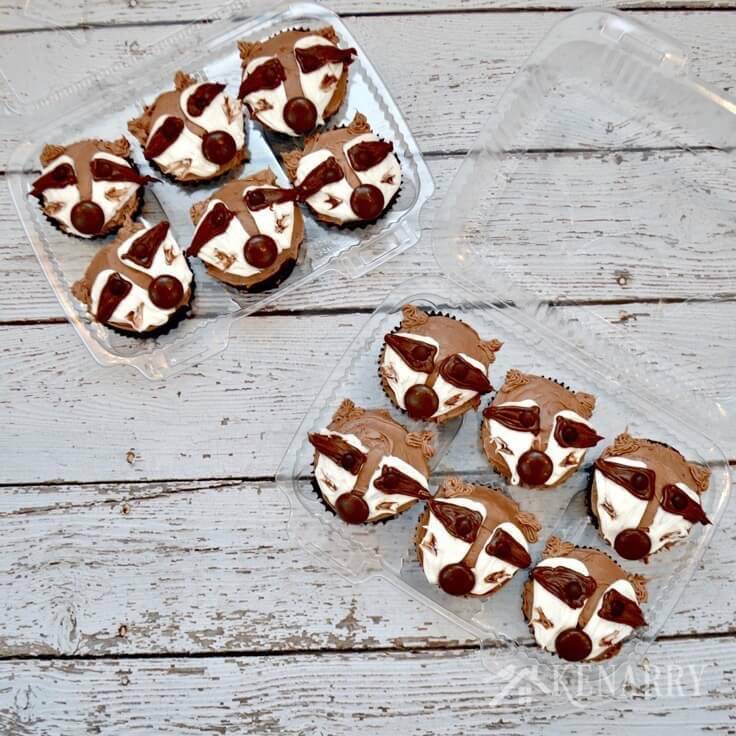 While we used these Raccoon Cupcakes as a prize for a school fair, they would also make a fun birthday treat for your kid’s classmates at school. 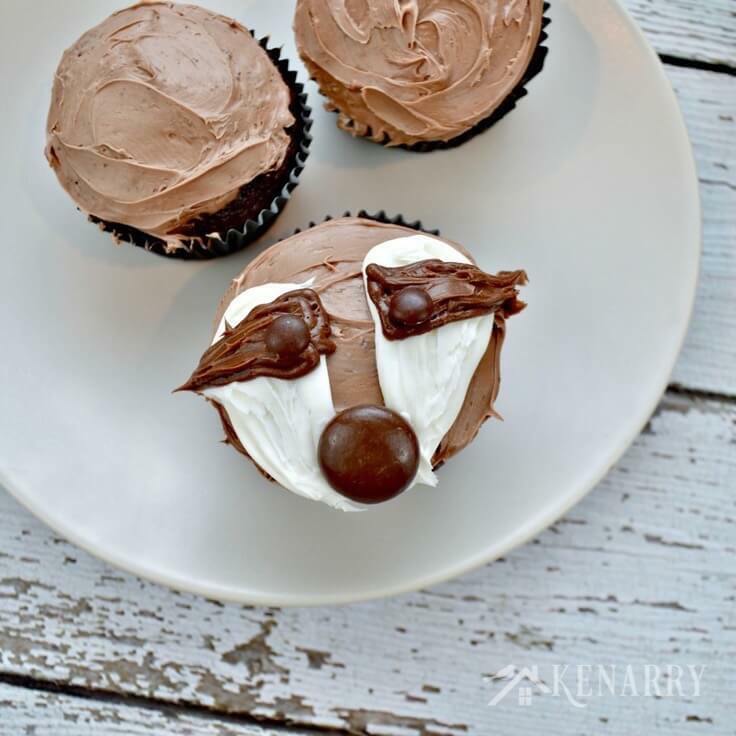 You could also host a woodland themed birthday party and use these Raccoon Cupcakes instead of a cake. However you choose to share these Raccoon Cupcakes, I hope your kids enjoy them as much as mine did. What a cute idea! These would be great for a woodland themed baby shower or birthday party. Thanks for sharing with us at Share the Wealth Sundays! Krystal – these would be adorable for a woodland themed baby shower! I hadn’t thought of that. Thank you so much for visiting us. It’s not hard at all to do. Hope you’ll give it a try, Amy! They look so adorable! Loved them! Thanks a lot for joining the Family Joy blog link up party! Pinned! How adorable are these cupcakes. I love them and so fun for the kids. Thank you for sharing at Dishing it and Digging it link party. So glad you stopped by to check out the Raccoon Cupcakes, Vanessa! You make it look so simple that even inept cake decorator me thinks I could do it. Awww thanks, Audrey! That’s what we were going for. I absolutely love these! Pinned! Thanks for sharing at the What’s for Dinner link party. Thank you so much for pinning our Raccoon Cupcakes, Helen! So glad you came by to see us! These raccoon cupcakes are so precious. Those are the cutest cupcakes I have ever seen!!! So glad you stopped by Oh My Heartsie Girls Friday Features this week to share, I appreciate it and I am sure that our other visitors will too! I have pinned and Tweeted. You are so sweet, Karren! I’m so glad you liked them and am thrilled you pinned and tweeted about them to share with your friends and social media followers. 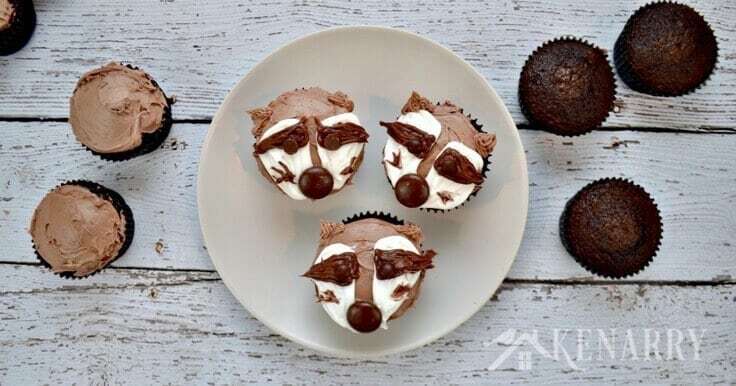 I bet your boys just loved these racoon cupcakes. They are just adorable! They sure did, Julie! Thanks! These little guys are just too adorable…I don’t know if I could ever eat them…oh well, I’m sure I could! Oh you definitely could! Maybe even two! 😉 Thanks, Colleen! Those raccoon cupcakes are so cute! Came over from the Mini Family link party … these are so awesomely cute. Pinning!! That’s so sweet of you to say and even sweeter that you pinned it too. Thank you! I had to check this out. These are so cute! I’m so glad you did! Thanks, Ava! These are just so stinking cute!! Stopping in from SITS Sharefest and hope you’re having a great weekend!! Thank you! Thank you! Thank you! So glad you came by from the SITS Sharefest, Charlotte. We had a wonderful weekend. You too? How cool are these cupcakes!! Any kid would love it! Thanks for bringing it to Fiesta Friday! Thank you, Suchitra! Glad you like them! Oh yay! That’s so good to hear, Donna! “Easy to follow” is what we were hoping for! These cupcakes are so adorable! I wish I had this when I threw a woodland themed baby shower. Pinned & shared. Thanks for joining us at the #InspirationSpotlight party. Oh yes! These would have been perfect for that baby shower. Maybe next time? Thanks for visiting and sharing, Theresa! 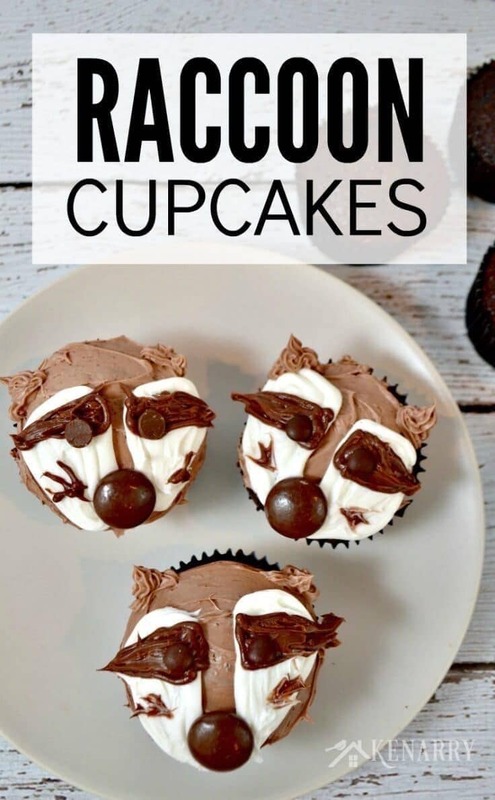 Your Raccoon Cupcakes look adorable and delicious! I really appreciate you sharing with us at Full Plate Thursday, hope you have a great day and hope to see you again soon! Miz Helen, we’re so honored you came by to check out the raccoon cupcakes. Thanks! If I won these cupcakes, they would be a BIG win for me, too! This is a great kid-friendly idea. Thanks for the video, it really helped to see how to “paint” the face. 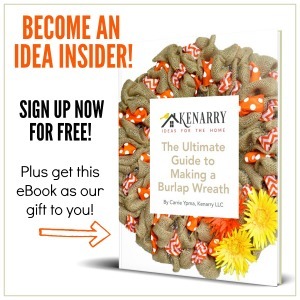 This is an dorable idea!! Awww…. thanks Pam! Cupcakes are always a fun prize, aren’t they? Thanks for stopping by! Thank you so much Josette! “The Kissing Hand” is a perfect book to give before kindergarten. What a fun tradition!